Cake icing is a mixture of butter, sugar, and flavoring. It is used to cover a cake as well as make edible decorations. A wide variety of textures and applications make them suitable for all occasions. Buttercream icings have a sweet, buttery flavor that tastes creamy and looks good. They can be used for icing cakes as well as creating borders and decorations. Consistency can range from thin to stiff. The cake shown at right is iced and decorated with buttercream icing. Royal icing is made with meringue powder. It has a sweet flavor, dries hard, and is primarily used for flowers, figure piping, and filigree or lace work. This is the icing usually used for gingerbread houses as it hardens and holds the house parts together. Rolled fondant icing covers cakes with a smooth surface. It is rolled out like dough before being molded over the cake. This type of icing will stay semi-soft on cakes, and decorations can be cut out of it. Special tools are available to roll the icing and mark designs on it. 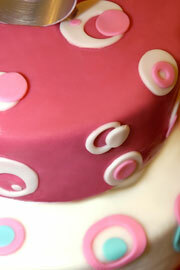 Poured fondant icing also covers cakes with a smooth surface. It is poured over the cake, such as petit fours, and dries to a semi-hard surface. 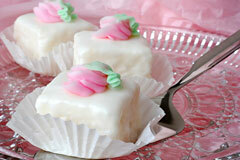 Shown at right are three petit fours with poured fondant icing. 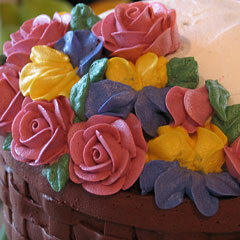 Stabilized whipped cream is a light whipped icing, which remains soft on the cake. Cakes with this icing must be used immediately or refrigerated. Fluffy boiled icings have a marshmallow consistency that ices a cake smoothly and fluffily. They dry quickly and the cake should be used within 24 hours. 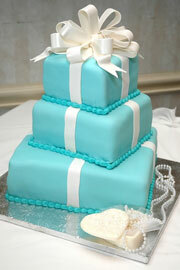 All icings can be flavored as desired, and concentrated icing colors can be added to enhance the cake decorations. Check cake decorating suppliers for these items and icing recipes. Illustrated below are two stacked cakes, one square and one round, with rolled fondant icing and decorations.